Each time I was pregnant, during my nesting phase, I would prep easy freezer meals for after baby came home from the hospital. I ended up having two unplanned + one planned C-sections so it was super helpful to my recovery to know that I had a stash of food in the freezer so nobody would starve (baby excluded). Stork the freezer! There are plenty of recipes/meals/dinners you can make that are easy to freeze. Spaghetti sauce is easy to make ahead + freeze. Then all you have to do is thaw the sauce + boil the pasta. Baked ziti is an easy recipe to make, freeze + reheat when it’s time to eat. Soups are another great food to make ahead of time, freeze + throw in the crock pot or microwave to reheat. You can add a side salad + pair it with a nice bread, if you’re so inclined. I LOVE crock pot meals. There is something so satisfying + easy about throwing a bunch of ingredients into a crockpot, turning that sucker on + letting it go to work. Sometimes, I follow a recipe. Other times, I just throw a bunch of ingredients in the crock pot that I think will make a yummy dinner + let the magic happen (or the chips fall where they may–not actual chips but proverbial chips, that it). Do yourself a favor + buy some crock pot liners. These are life changing because it makes cleanup as easy as cooking the meal is. Another great option is meal kits. These kits come with all or the majority of the ingredients you need to prep + freeze meals ahead of time. Some are freezer meals that come in sets of 5, so you you just go to your freezer, pull out a meal, pop it in the oven or crock pot + promptly put dinner on the table for your family the fast + easy way. As an added bonus, you can find healthy KETO freezer meals, too. Let’s be real. When 5 p.m. rolls around, the last thing you want to do is brave the grocery store + start cooking dinner from scratch — especially if you have a newborn, but even if you have older kids. Don’t let every evening roll around, where you end up facing a mob of hangry family members + you’re staring at an empty fridge. Use one or all of these options to prep + freeze meals so that you can feed yourself + your family as you ease into life with a new baby. If your kids are anything like mine, they have their picky eating periods + I think they get bored with the same old lunches. Most of us are returning to school tomorrow after the holidays so here are some ideas from Do You Bake? + Crave It to inspire some yummier + more exciting lunches in 2019. Create a delicious medley of sweet and savory for a perfect lunch time meal. When your kiddos don’t feel like a meat sandwich, substitute it with a delicious berry + cream filling. Pair a creamy berry sandwich with sliced vegetables such as celery, cucumbers or peppers. Add slices of meat for easy snacking. For a small sweet, bake up mini chocolate cupcakes topped with a delicious dark chocolate frosting. Prep 101: The Make Ahead Prep! #1 : Bake up a loaf of Do You Bake? Pumpernickel Bread (as shown) or EZ Country White Bread. Store wrapped in the fridge + pull out when ready to make your lunches! #2 : Make your Cream Cheese Filling! Make up a batch of Do You Bake? Love that Lemon Cheese Ball Mix (One 8-oz brick of cream cheese + 1 package of mix) or Blueberry Blast Cheese Ball Mix (One 8-oz brick of cream cheese + 1 package of mix) + refrigerate until you are ready to build your sandwich! #3 : Make your Do You Bake? Gluten Free Cheeky Chocolate Cupcakes ahead of time! Make mini cupcakes for little one + two bite dessert treats for your lunch. Both Pumpernickel & EZ Country White Bread freeze great! Simply slice your loaf into perfect lunch portions + freeze your sliced loaf in a freezer ready zip top bag. Remove slices of bread as needed. Gluten free cheeky chocolate cupcakes freeze well! Simply frost your mini cupcakes, place them on a sheet pan + pop them into the freezer until frozen. Remove from sheet pan + pop your mini cupcakes in freezer ready zip top bags. Remove individual frosted cupcakes when ready to use! #1 : Cut 2 slices of bread + smear on a little of your softened cream cheese dip (about 1 – 2 tablespoons per slice of bread). Top one slice of bread with your favorite sliced berries (Strawberries, blueberries, raspberries or blackberries) + place the second slice of bread on top. Cut into triangles or squares. Add to one compartment of your bento box. This lunch is a fun, healthy + delicious option when your kiddos don’t feel like eating another sandwich. Much of this lunchbox can be made ahead of time, frozen + pulled out at future dates for perfectly portioned lunchbox options. Serve with fresh fruit, vegetables + a delicious dipping sauce for a great balance of flavors + textures. #1 : Make the chicken nuggets: Follow the package directions on the box of nuggets. Simply cool your cooked nuggets completely + freeze in zip top bags into individual portion sizes. #3 : Make your Dunk the Chunks Cookies: Follow the package directions on the box of Do You Bake? Dunk the Chunks Cookies mix. These make great snacks + desserts as well. There will be plenty leftover. You can freeze them in packages of twos, threes or fours + pull them out as you plan to build your lunchboxes. Time To Make Your Lunchbox! Create mini taco bowls for a perfect lunch time meal. These are great make ahead lunches on the weekend. #1 : Use Chicken or ground beef (1 pound boneless/skinless chicken sliced thin or beef) + saute in 1 – 2 Tablespoons of Do You Bake? Fiesta Seasoning + a teaspoon of vegetable oil or a box of Enchilada dip with a sprinkle of salt (to taste). Let cool, add to a container + refrigerate until ready for your lunch packing. You can freeze your cooked meat in 1/2 cup portions for future taco bowl lunches. #2 : Make Your taco bowls: Take 8 – 10″ flour tortillas + cut them in quarters. Place your quarter size pieces into a muffin tin + mould them around the tin. Prick the bottom with a fork so they don’t bubble up. Bake in your preheated oven (350F) for about 10 – 20 minutes, until golden. Let cool + pop out of your muffin tins. To get extra fancy, pick up a few dip cups with lids + add in a couple tablespoons of sour cream, guacamole or salsa. These are healthy, make ahead lunches that can also be made, frozen + enjoyed over the course of a month when you are short on time. Looking to pack some protein and nutrition into your kiddos’ lunch? 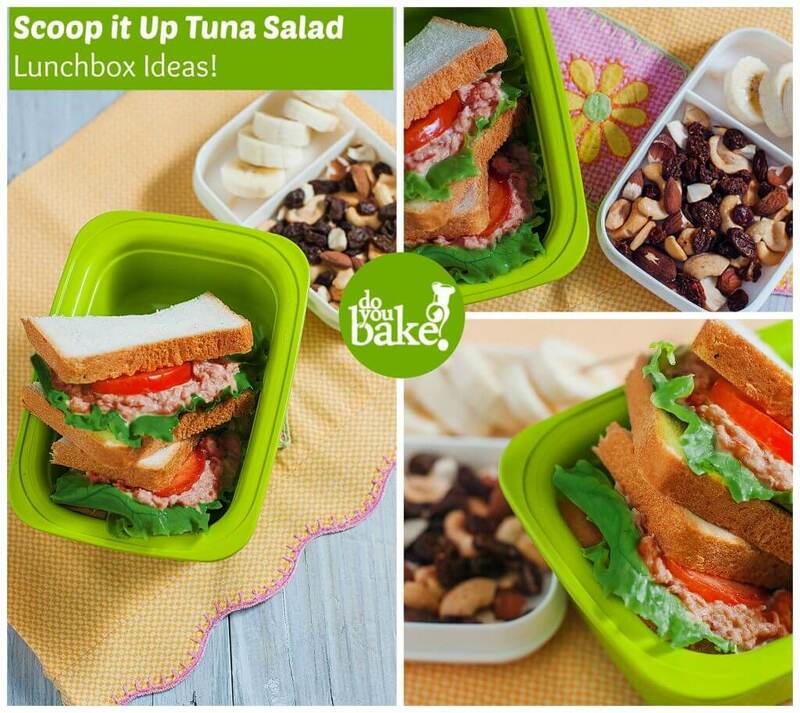 A tuna salad lunchbox does it for you! From a perfect medley of nuts to a healthy side of fruit + a perfect protein packed sandwich, your child will stay satisfied throughout the day. #1 : Use 4oz of tuna per sandwich for a perfect amount of protein. Add 1 Tablespoon Mayonnaise, 2 Tablespoons Greek Yogurt, pinch of salt + 1/2 of a tablespoon each of Do You Bake? For The Love of Garlic + Do You Bake? Chive ‘n’ Onion Seasoning per every 4oz of tuna. Chop additional onion, celery or scallions into your salad, as desired. Cover + refrigerate until you are ready to build your lunchbox. 1 package of Do You Bake? Powerhouse Nut Mix, a perfect medley of fruit + nuts! These are sure to be crowd pleasers + up your lunch game! Your kiddos will thank you for it. Before I had three little people hanging off my leg demanding things, I L-O-V-E-D to cook and bake. Seriously, though. Here is one of my fave go-to recipes because it is quick, easy and pretty healthy. Prepare the herb noodles/pasta according to the directions on the box. The Aldi one takes about 5 minutes to prepare each box. I use two boxes so that I have enough for all 5 of us. Prepare the brussel sprouts. I steam them in the bag they come in (I use the fresh ones from Aldi that are in the bag). After I steam them in the microwave, cut the brussel sprouts in half. Slice the zucchini and the yellow squash. Chop the broccoli from the stems. Add all of the veggies to a pan and saute. Cook until veggies are to your desired tenderness.